Sergio Leone’s “Man with No Name” trilogy is probably the most famous, and certainly the most acclaimed of the many “Spaghetti” Westerns made in the 1960s, but other characters, such as Django and Sartanna, also seized the public’s imagination and spawned sequels, sometimes in name only. Unrelated European westerns would be retitled and released in other markets as whichever character the lead most resembled. So it was that distributors released 1971’s Indio Black, Sai Che Ti Dico:Sei un Gran Figlio Di… (Indio Black, You Know What? You’re a Big Son of a…) in the United States as Adios, Sabata to cash-in on the success of 1969’s Sabata, although some report that the film was re-imagined as a Sabata sequel while still in production. Adios, Sabata unsurprisingly shares many similarities in style, characters, and plot with both the earlier film and the other sequel, The Return of Sabata (also from 1971) as Gianfranco Parolini (Yeti) directed and co-wrote (with Renato Izzo) all three films. Whether the name change came in-production or after, Indio Black (Yul Brynner, Westworld) is easily distinguished from Sabata (Lee Van Cleef, El Condor), and not just because they’re played by different actors. While Sabata seems modeled on Cleef’s earlier Colonel Mortimer character from For a Few Dollars More, sporting a dandy’s hat and cloak and fine, custom-made weapons with which he demonstrates his marksmanship, Brynner’s Indio wears black fringed buckskins with no undershirt and fires his odd side-loading lever-action rifle from the hip. Sabata is also more of a treasure hunter than a straight-forward hero like Indio, who is presented as a defender of the people beloved by children. The film is set just after the American Civil War, a time when Mexico was briefly ruled by an Austrian monarch Maximilian. The Mexican resistance hires American mercenary Sabata/Indio to steal a valuable shipment of gold from the Austrians and deliver the money to gun runners. At Sabata’s disposal is a rag-tag force of resistance veterans led by the patriotic and brave, if not terribly bright Escudo (Ignazio Spalla, who played similar roles in all three Sabata films). Escudo’s most memorable men are Septembre (Salvatore Borghese, A Bullet for the General), an acrobat who lethally flings musket balls with his special shoes, and his brother Gypsy, who does a flamenco dance before executions. Sabata is eventually joined by Ballantine (Dean Reed), a fellow American mercenary (and piano player and painter), who spends the entire film attempting to double-cross Sabata, but never quite going through with it successfully (like Sabata’s confederates in the other films). Over the course of the film the men will constantly be attacked by assassins, the Austrian secret police, other soldiers and bandits, and will face double crosses from both Ballantine and members of the resistance. The film ends with an absolutely ludicrous battle inside the fortress of corrupt Austrian officer Colonel Skimmel (Gerard Herter, The Big Gundown) in which a handful of men kill what seems like several hundred soldiers, beginning when they escape their own execution via a bible loaded with nitro! 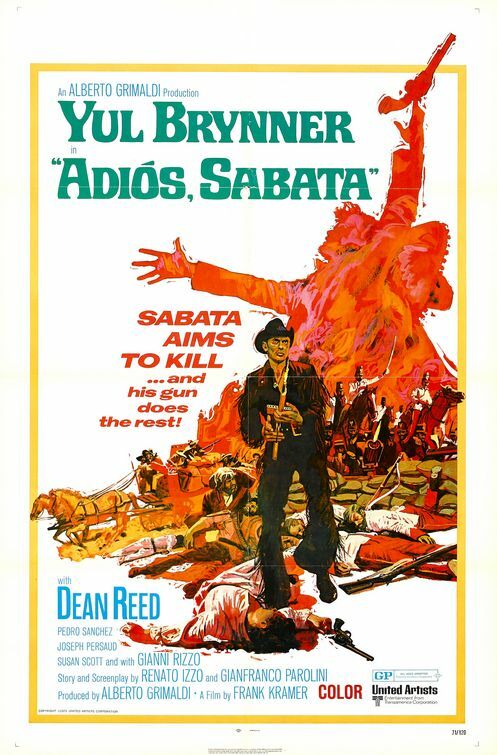 Adios Sabata is somewhat less outlandish and more serious than either of the Sabata films that starred Cleef, and Brynner’s Indio/Sabata is more stoic and less comedic than Cleef’s. The role of Sabata seems like one of the few lead roles really suited to Cleef, but transferring Brynner into the same situation does not work as well, though Brynner certainly gives it his best shot and is entertaining in his own way. The story seems to lift more heavily from the Leone films than the other films, as well, with a somewhat similar unequal triumvirate of protagonists, a bridge that must be exploded, and so on. While the film looks great, and has its moments, it loses momentum in the endless double-crosses and attempts at tension between Sabata, Ballantine and the rebels, and by the time of the ludicrous last combat any question of how the film would end was taken care of by the endless scenes of Sabata mowing down waves of combatants with his distinctive (and incredibly silly) side-loading rifle. The film is similar enough in tone to the other Sabata films that fans will enjoy it, but the uninitiated would do better to start with the original film before trying this one. If nothing else, watch the trailer, which packs most of the more outlandish scenes into a tidy 2 minute package. This entry was posted in Full Reviews, Reviews, Sequel, Spaghetti Western, War Movies, Western and tagged cash-in, dubbed, execution, gadgets, gatling gun, gold, Guerrillas, in-name-only-sequel, Produzioni Europee Associati (PEA), Sabata, secret police, United Artists, Yul Brynner. Strictly speaking, Maximilian was Austrian by birth, but he’d been installed by Napoleon III, and received no support from the Hapsburgs. That may well be, Edward, but in the film they constantly refer to “the Austrians”. Good to know, though, since I’ve previously seen films that reference the era and mention the fact that the Emperor was installed by Napoleon III and I was beginning to wonder how many European monarchies were installed in Mexico.